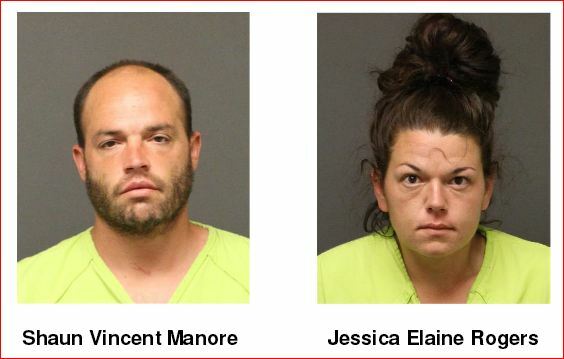 Mohave County Sheriff’s deputies arrested Shaun Vincent Manore, 30, and Jessica Elaine Rogers, 24, both of Meadview, Monday (4/3) afternoon. Manore was arrested for burglary, possession of dangerous drugs, two counts of possession of drug paraphernalia, a probation violation warrant issued by Maricopa Count y Superior Court, felonies, along with possession of marijuana and a failure to pay warrant issued by Kingman Justice Court, misdemeanors. Rogers was arrested for burglary, possession of drug paraphernalia and a probation violation warrant issued by Pima County Superior Court, all felonies. Approximately 1:00 p.m., while deputies were in the parking lot of the Meadview Chamber of Commerce they were approached by a concerned citizen. The concerned citizen advised that he has observed two subjects inside his neighbor’s fifth wheel trailer and a quad parked outside. The concerned citizen further advised that his neighbor’s fifth wheel trailer was broken into a couple weeks ago. Deputies responded to the property in the area of Glenwood Road and Sand Hill Lane. Deputies observed a subject exit the trailer and continued walking at a fast pace while another subject joined the first subject. Deputies further observed both subjects wearing black dark clothing. Deputies eventually took both subjects into custody without further incident about 2 miles away from the trailer in the area of Century Drive and Rainbow. The subjects were identified as Manore and Rogers. A records check showed Manore and Rogers to have active warrants. A search of Manore revealed a plastic bag containing a crystal substance, a purple bottle containing marijuana and a pipe with residue. Rogers was found in her possession to have a glass pipe with residue. Deputies contacted the owner of the property and trailer. The owner advised that he wanted prosecution on the subjects. They were transported and booked into the Mohave County Jail.